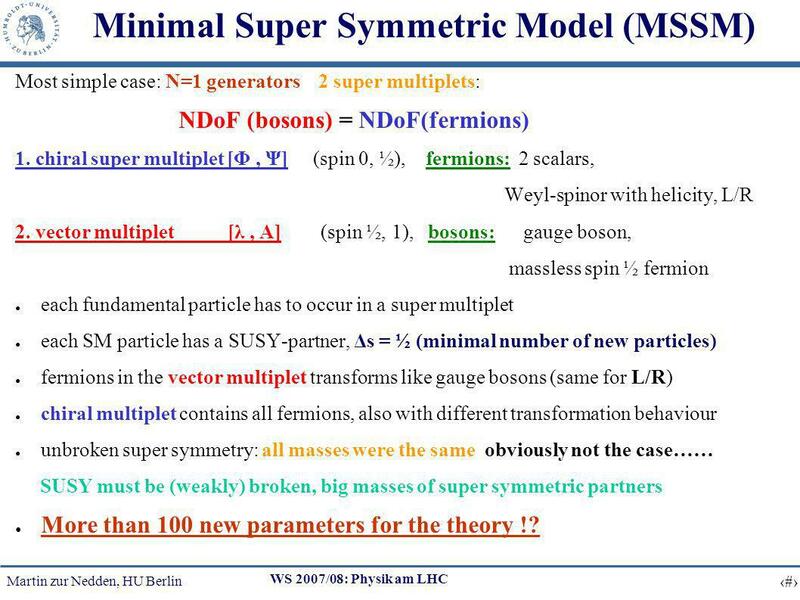 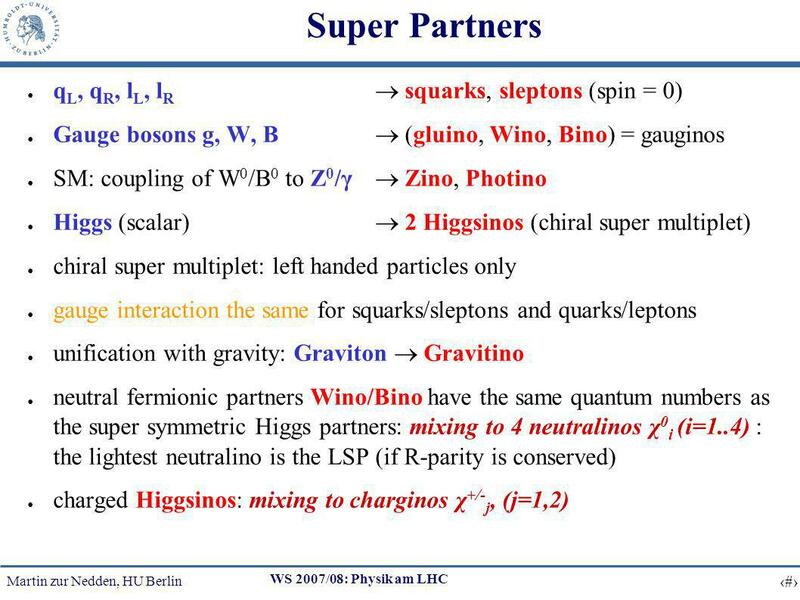 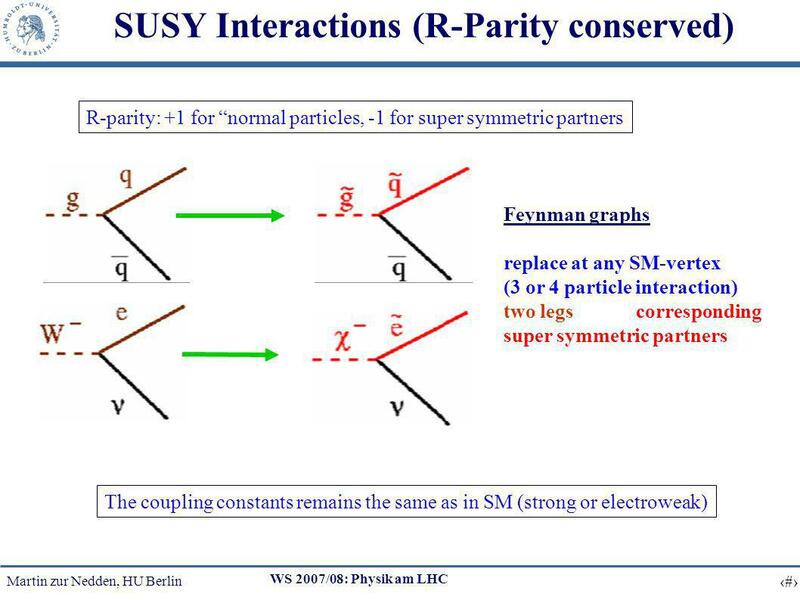 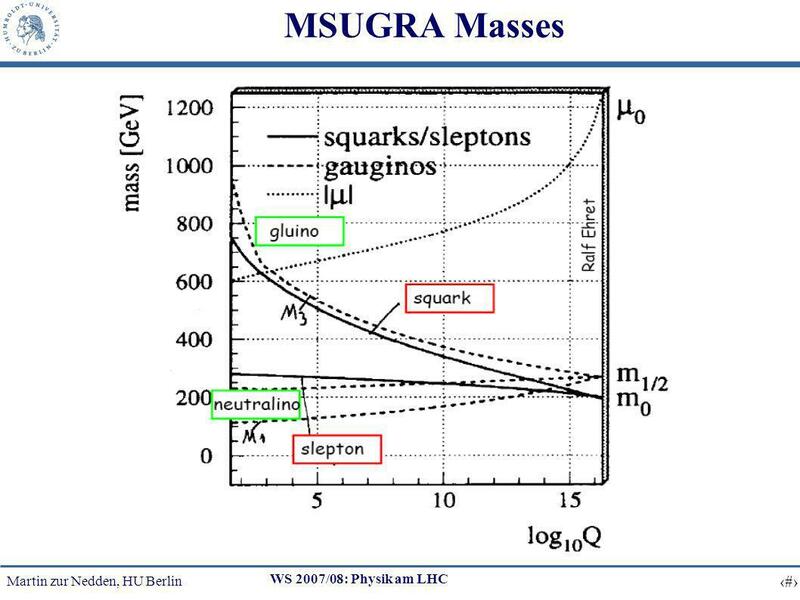 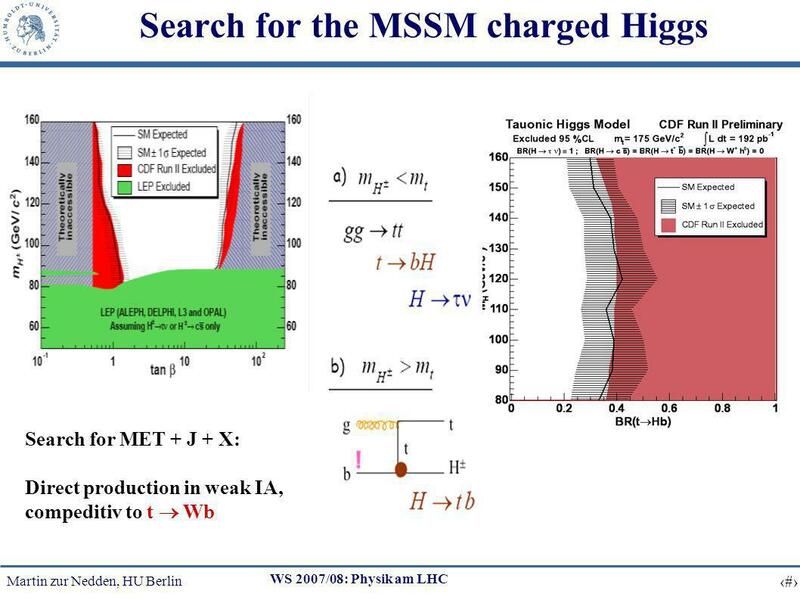 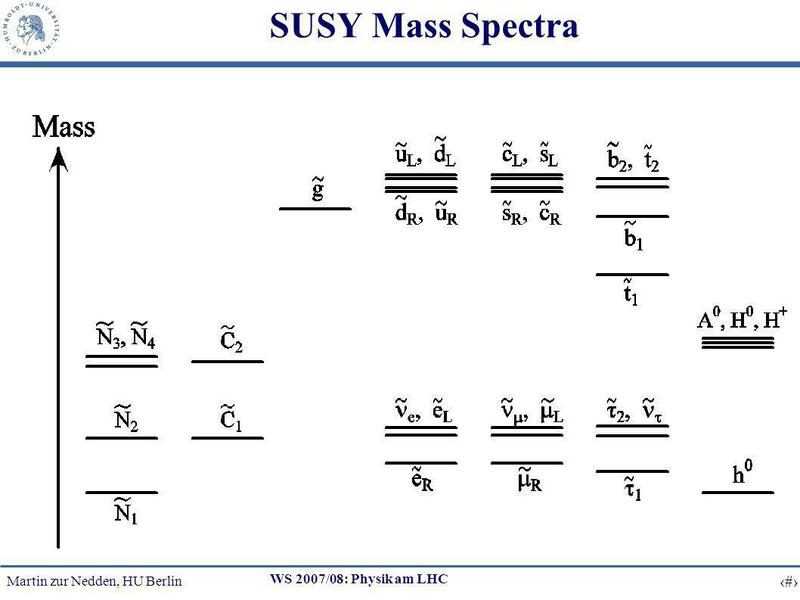 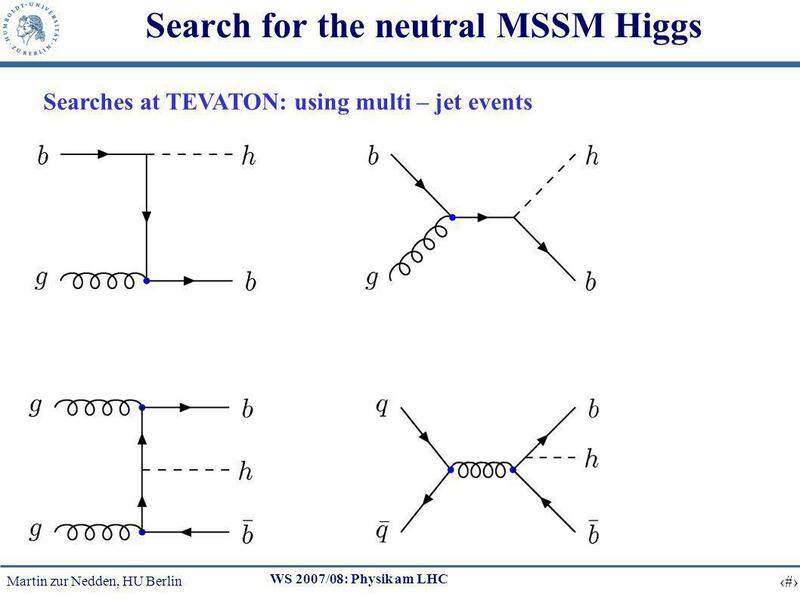 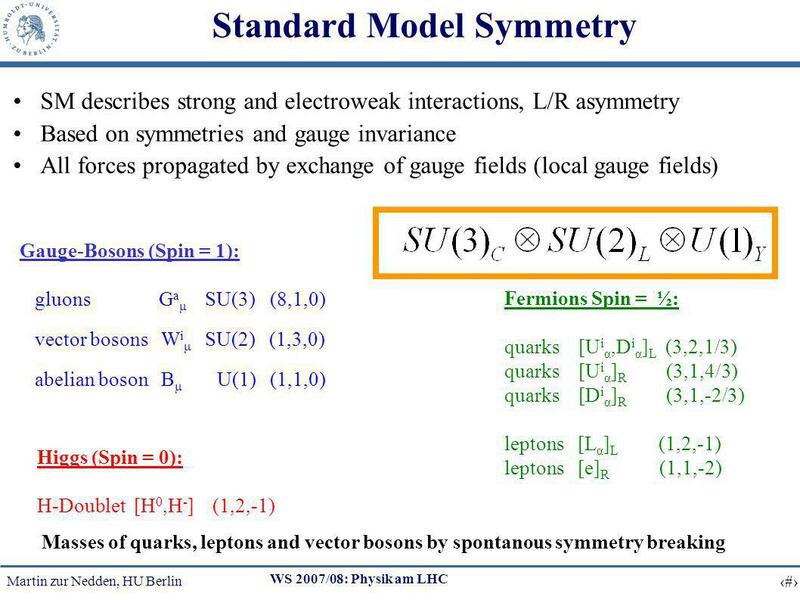 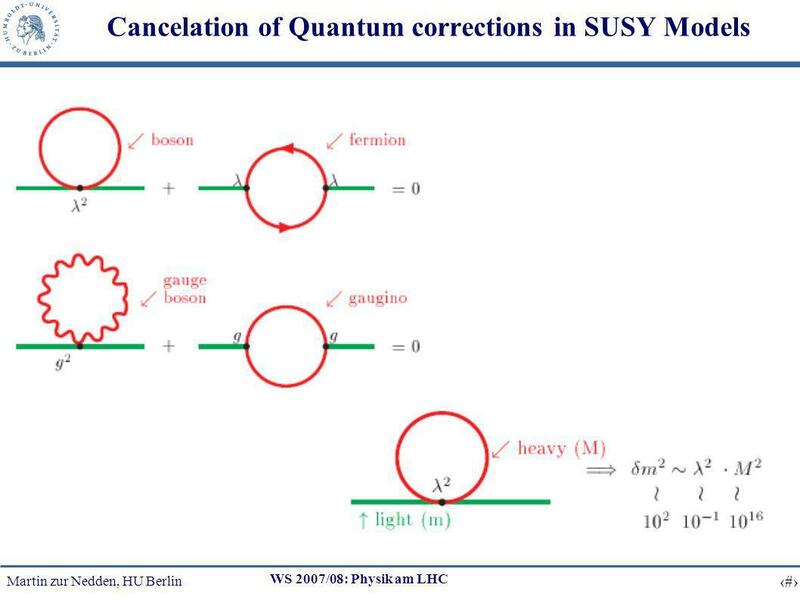 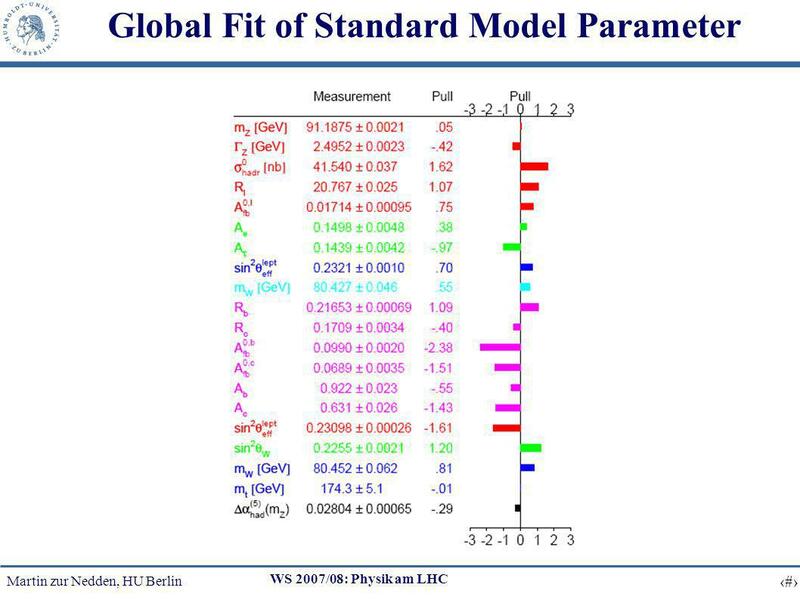 7 Martin zur Nedden, HU Berlin 7 WS 2007/08: Physik am LHC Minimal Super Symmetric Model (MSSM) Most simple case: N=1 generators 2 super multiplets: NDoF (bosons) = NDoF(fermions) 1. chiral super multiplet [Φ, Ψ] (spin 0, ½), fermions: 2 scalars, Weyl-spinor with helicity, L/R 2. vector multiplet [λ, A] (spin ½, 1), bosons: gauge boson, massless spin ½ fermion each fundamental particle has to occur in a super multiplet each SM particle has a SUSY-partner, Δs = ½ (minimal number of new particles) fermions in the vector multiplet transforms like gauge bosons (same for L/R) chiral multiplet contains all fermions, also with different transformation behaviour unbroken super symmetry: all masses were the same obviously not the case…… SUSY must be (weakly) broken, big masses of super symmetric partners More than 100 new parameters for the theory !? 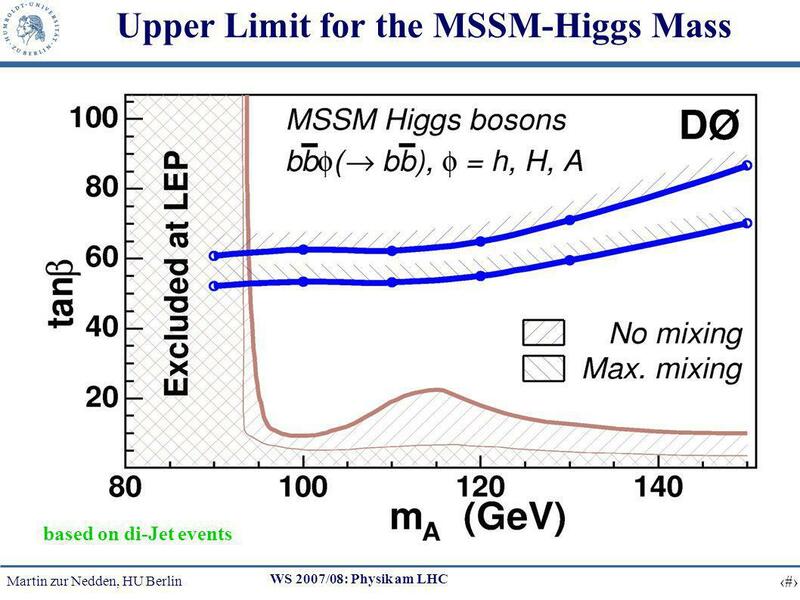 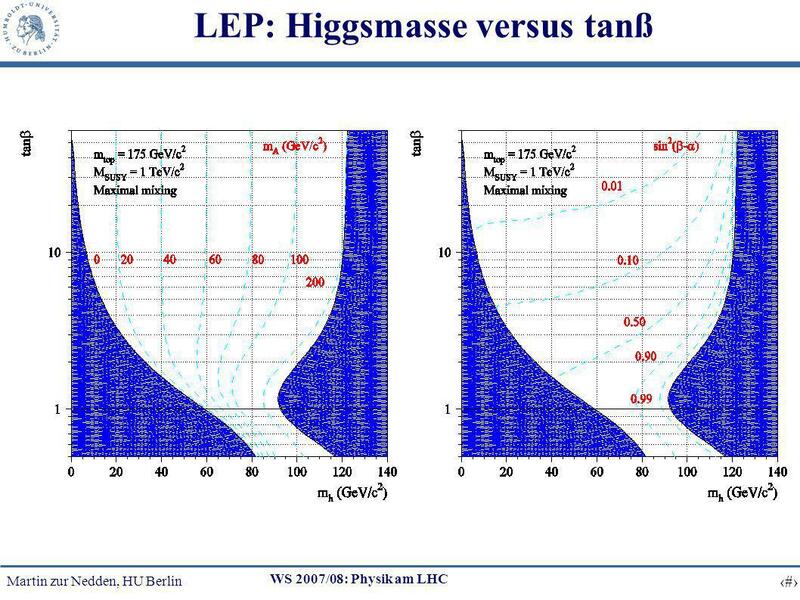 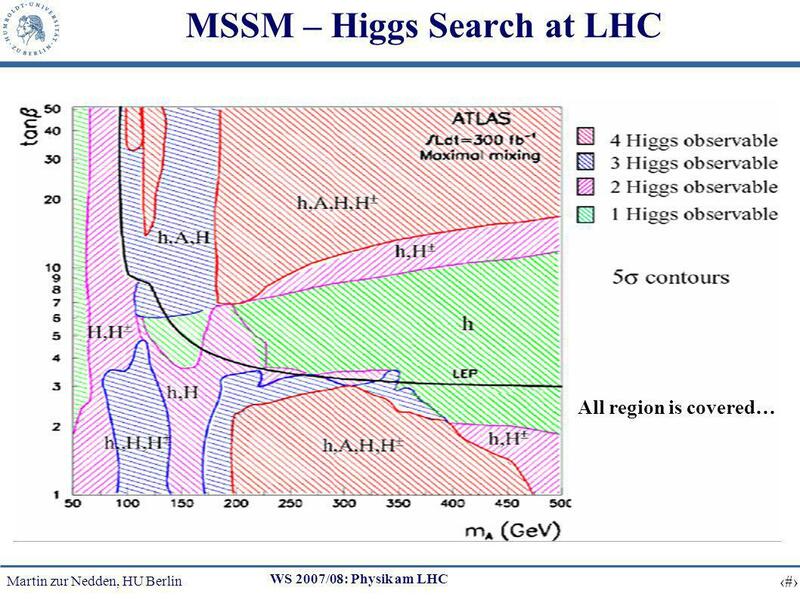 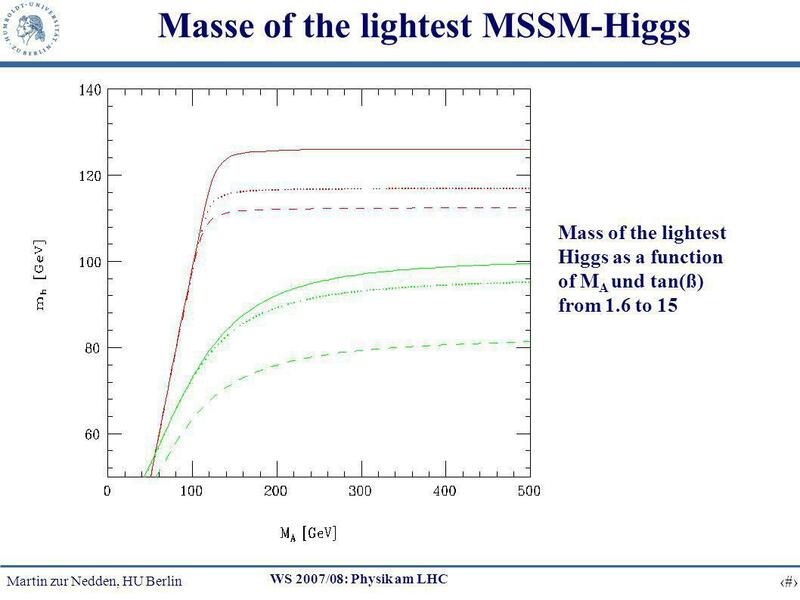 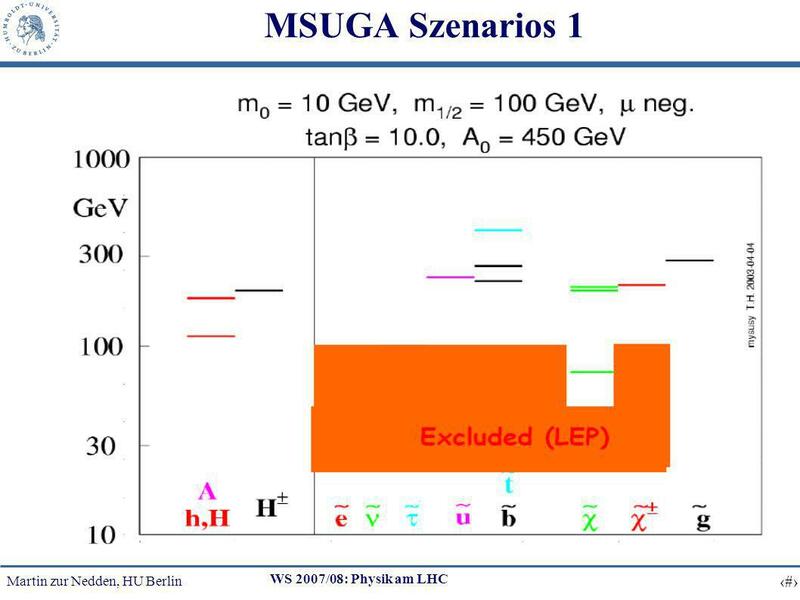 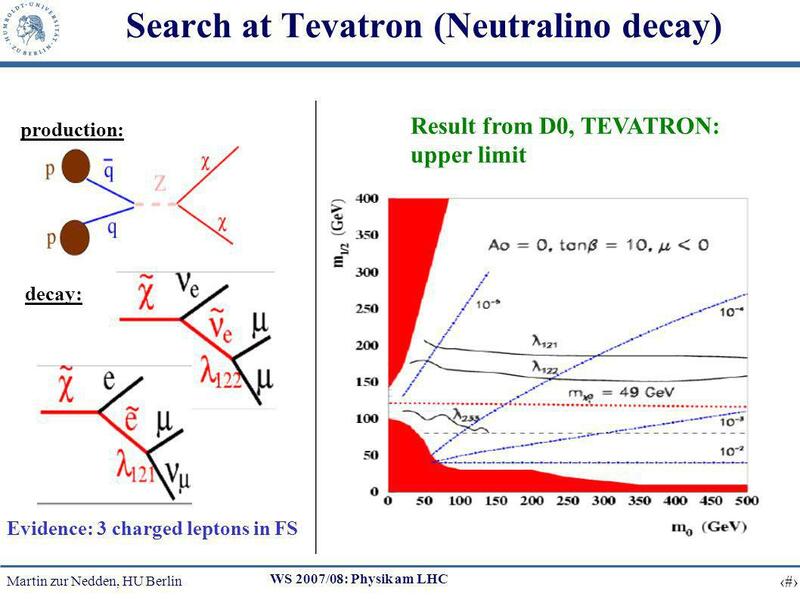 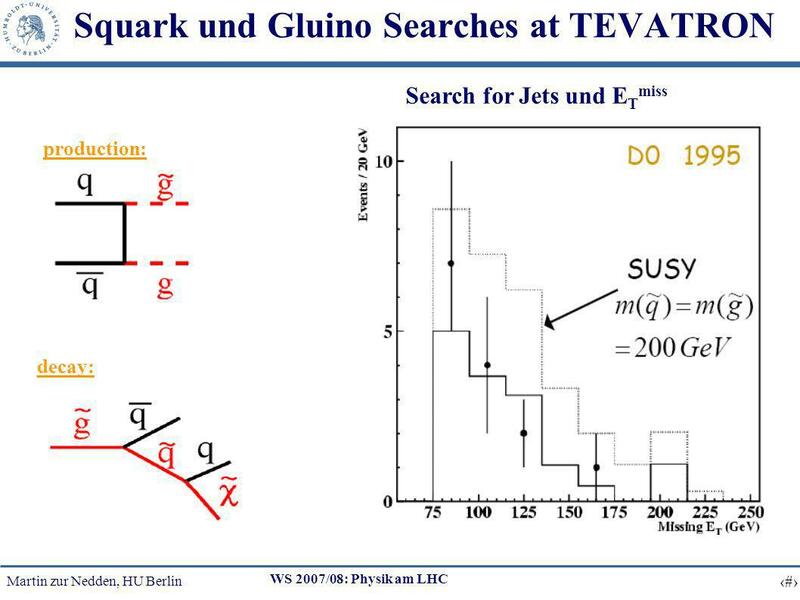 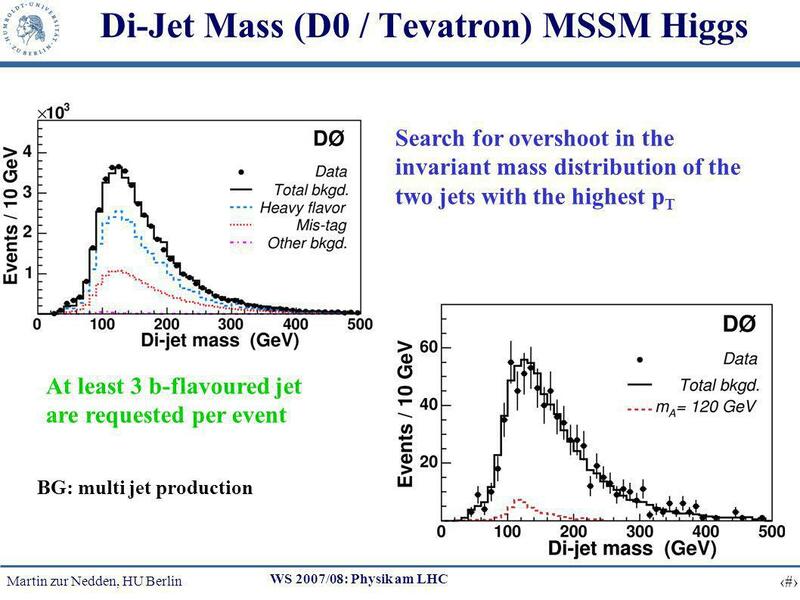 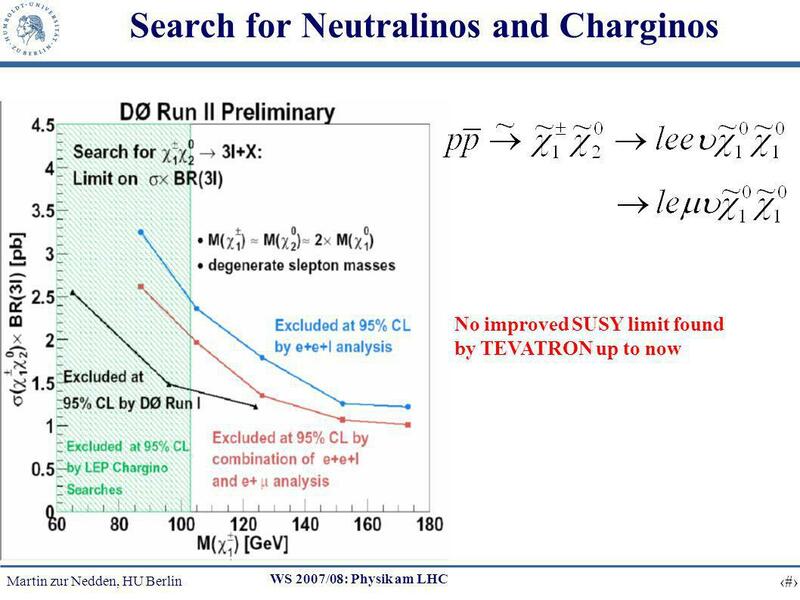 35 Martin zur Nedden, HU Berlin 35 WS 2007/08: Physik am LHC LHC discovery potential Time Mass sensitivity 1 month ~ 1.3 TeV 1 year ~ 1.8 TeV 3 years ~ 2.5 TeV Maximum limit ~ 3 TeV Supersymmetric Particles and dark Matter The neutralino is a good candidat for dark matter in the univers, if R-parity is conserved. 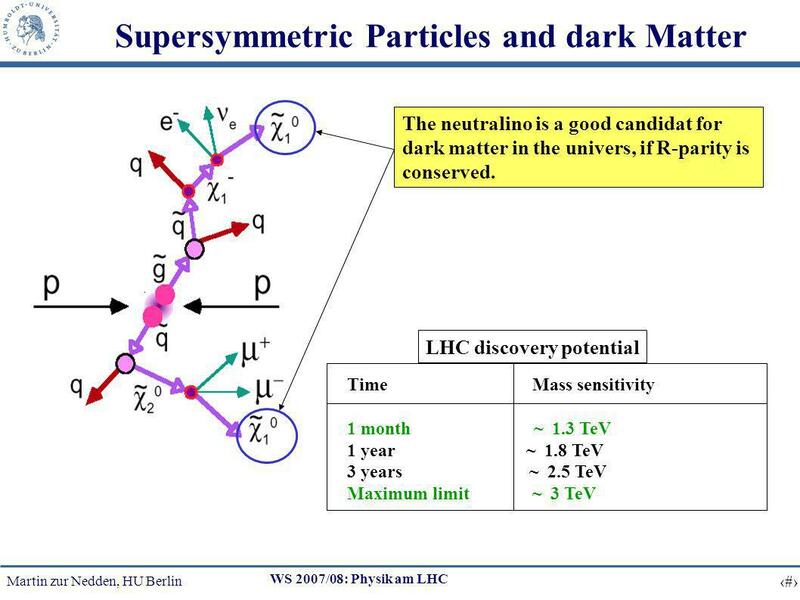 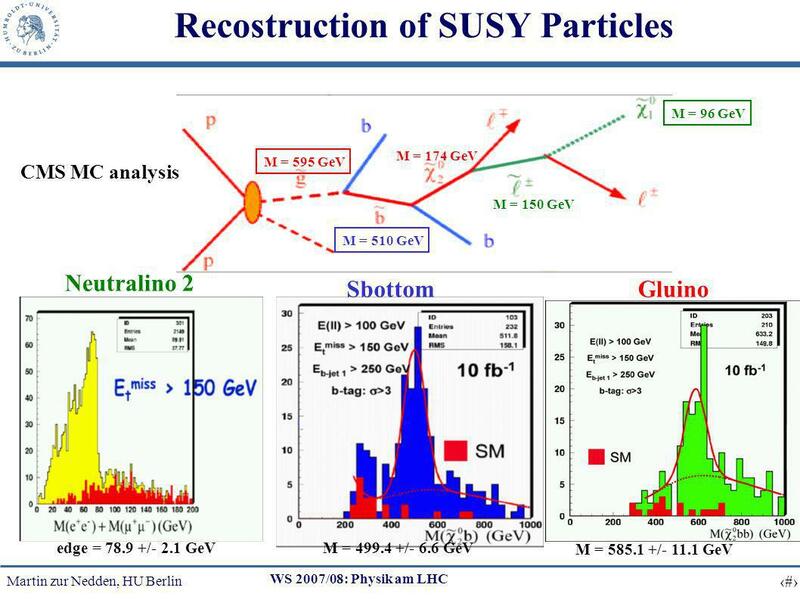 Download ppt "Martin zur Nedden, HU Berlin 1 WS 2007/08: Physik am LHC 6. 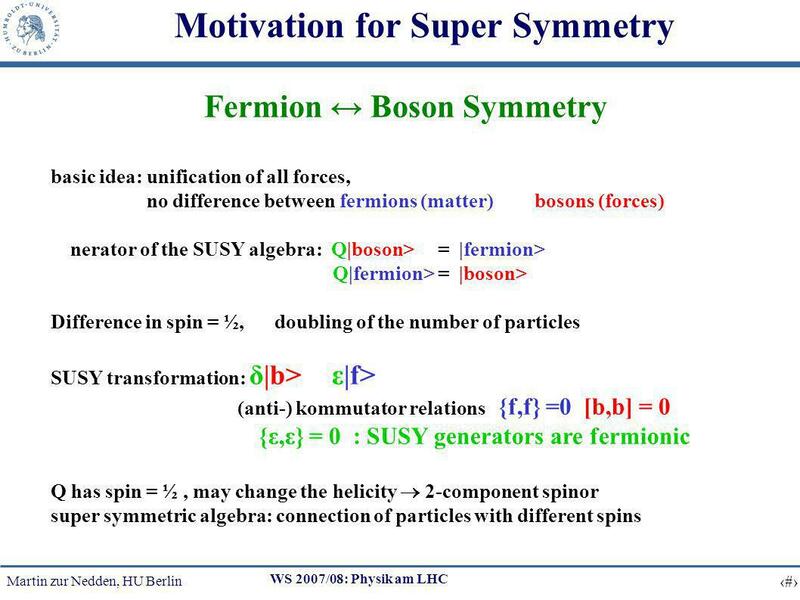 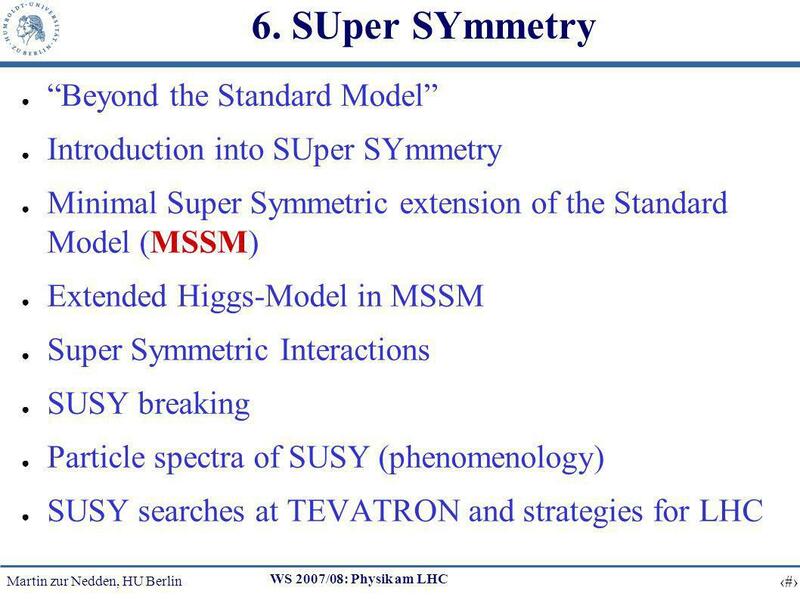 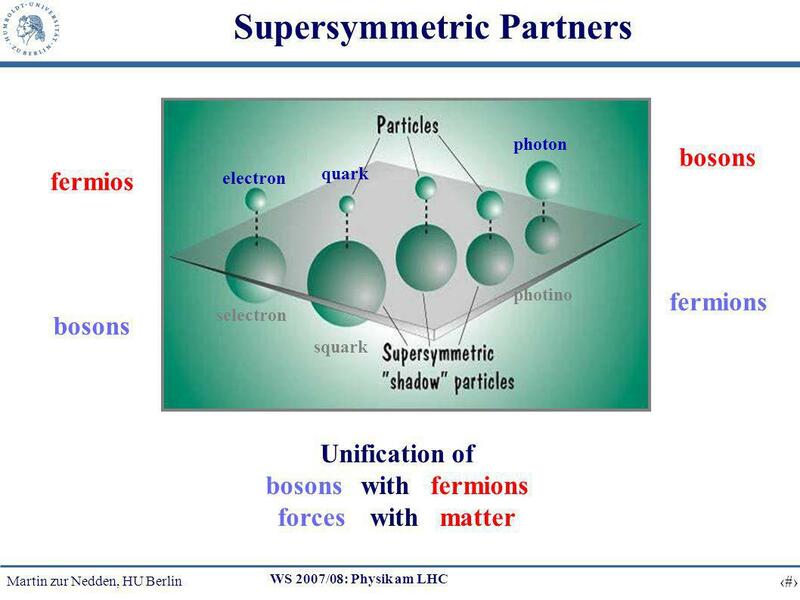 SUper SYmmetry Beyond the Standard Model Introduction into SUper SYmmetry Minimal Super Symmetric." 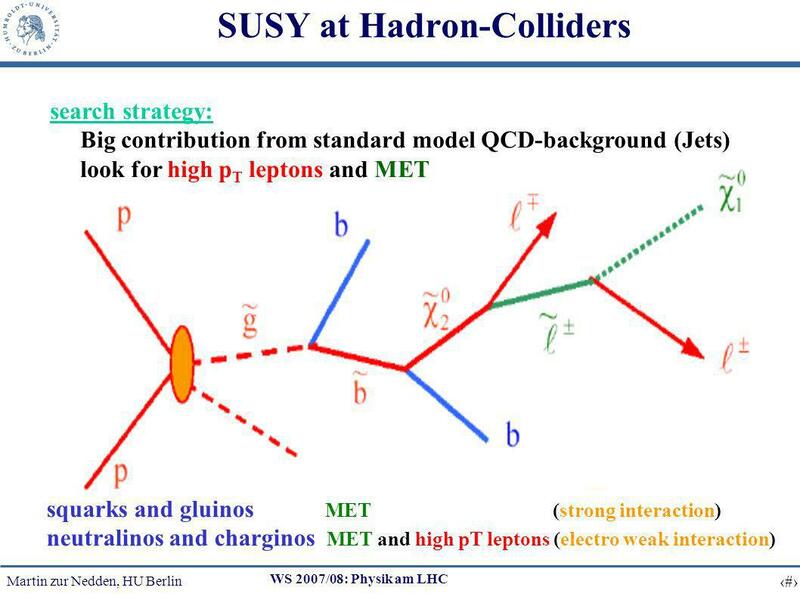 Luca Stanco - PadovaEW and NP at HERA, Photon EW at HERA Luca Stanco – INFN Padova on behalf of ZEUS and H1 collaborations and RELATED NEW PHYSICS. 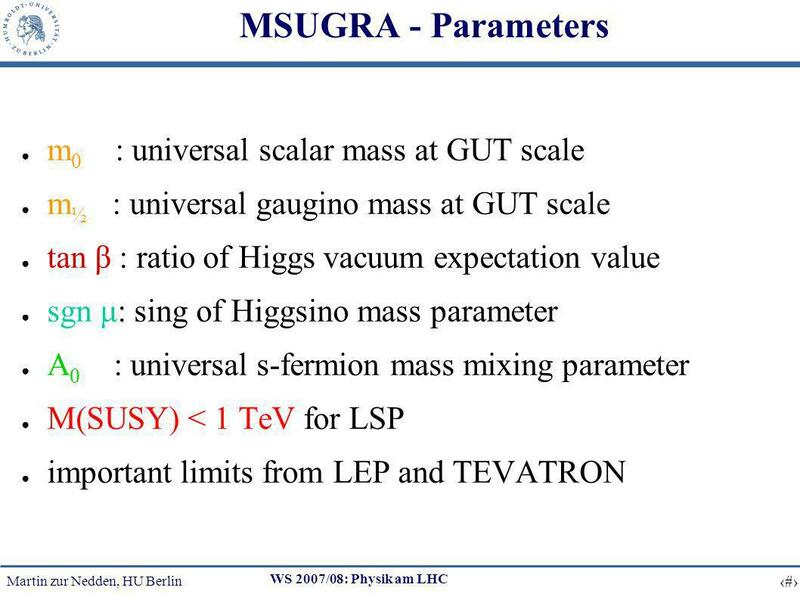 TeV scale Universal seesaw, vacuum stability and Heavy Higgs at the LHC Yongchao Zhang ( 张永超 ) Center for High-Energy Physics, Peking University w/ Rabi. 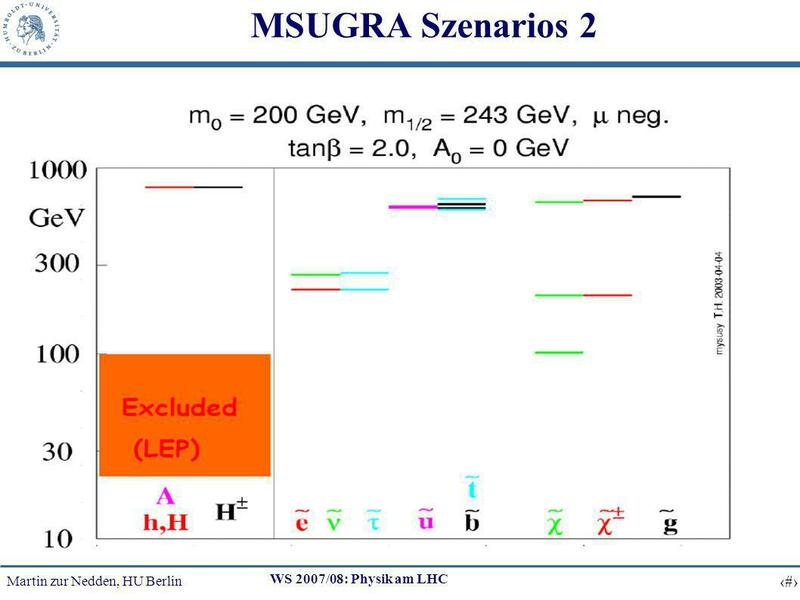 Effective Operators in the MSSM Guillaume Drieu La Rochelle, LAPTH. 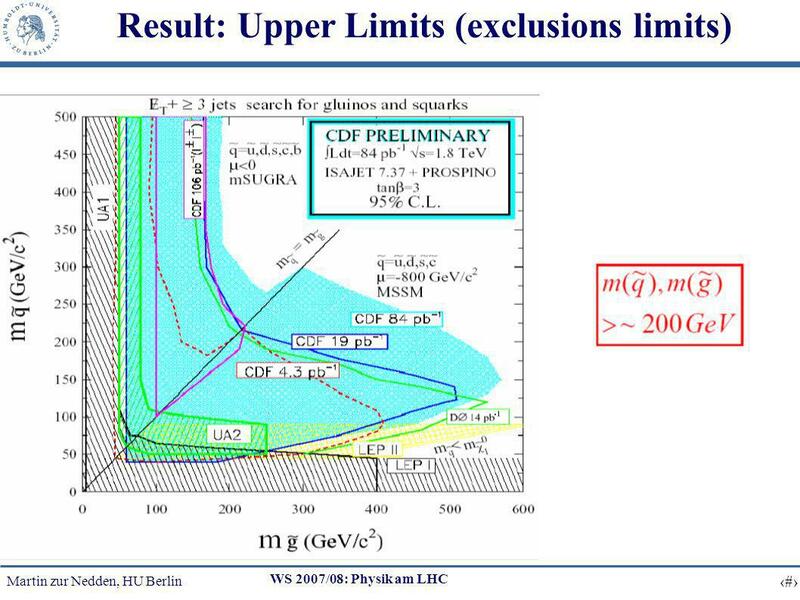 Gennaro Corcella 1, Simonetta Gentile 2 1. 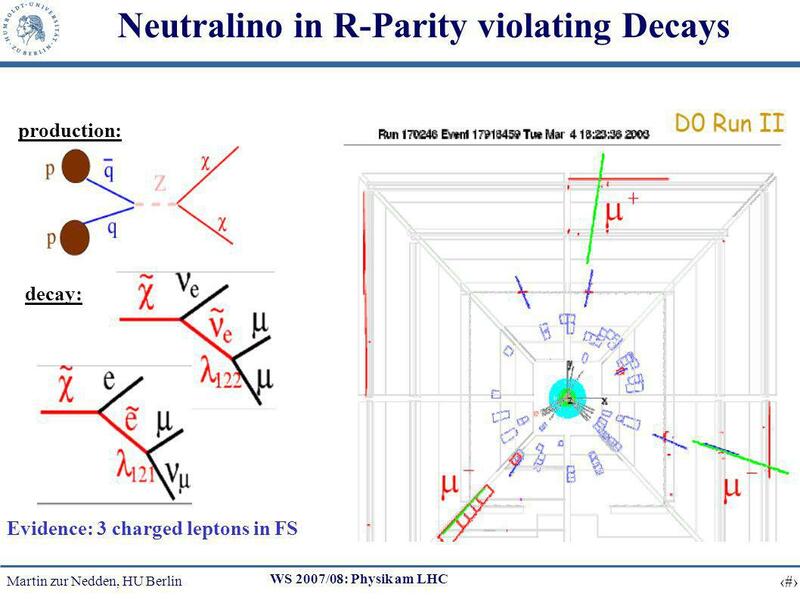 Laboratori Nazionali di Frascati, INFN 2. 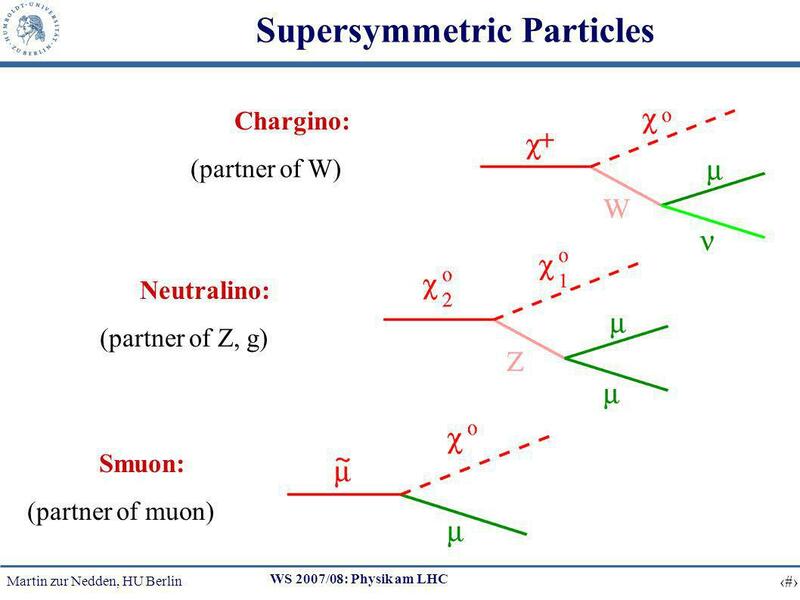 Università di Roma, La Sapienza, INFN Phenomenology of new neutral. 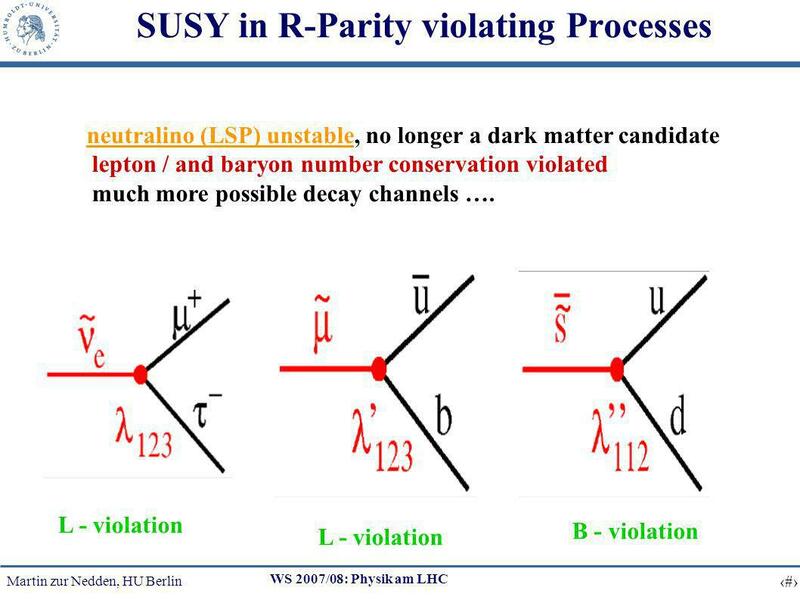 Susy - Oct 2004Aldo F. Saavedra (LBL) Basic Supersymmetry Aldo F. Saavedra LBL. 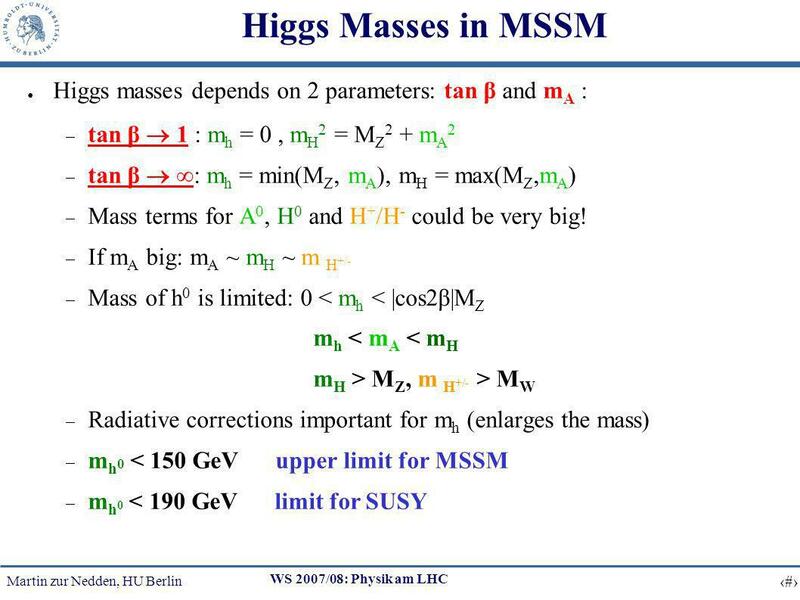 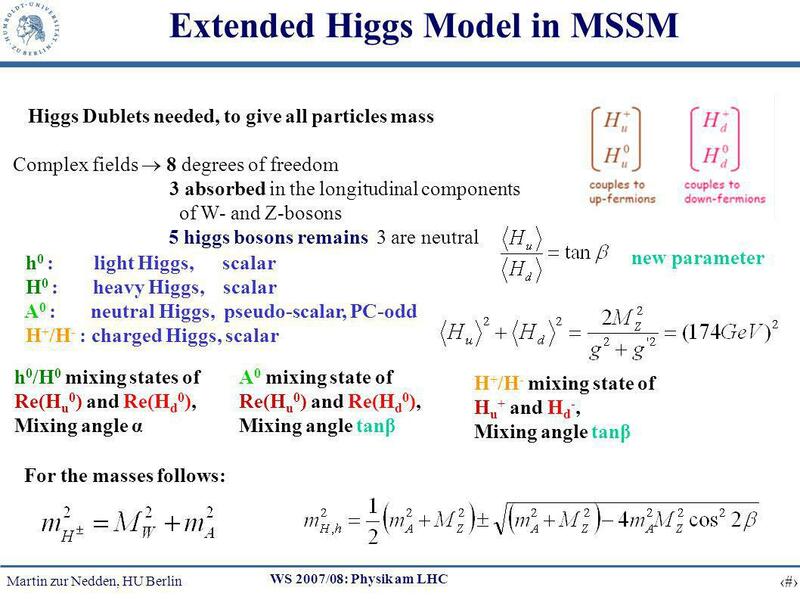 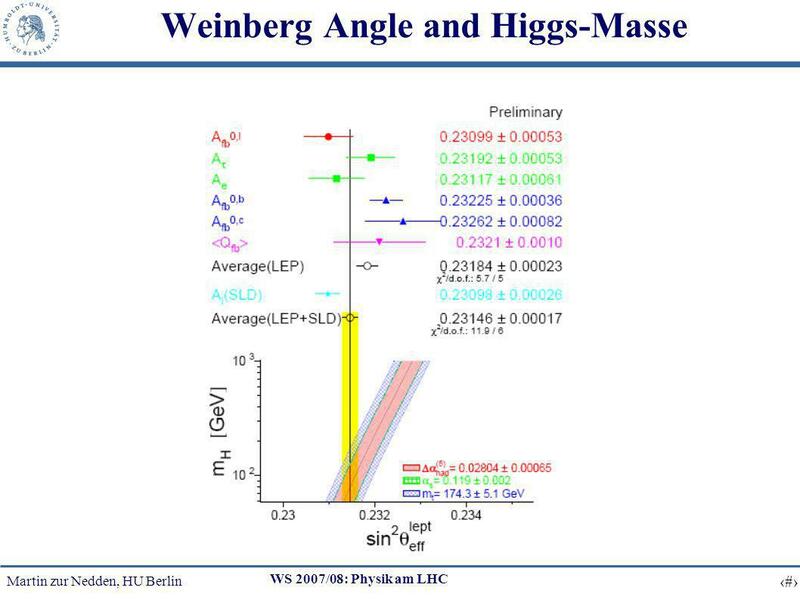 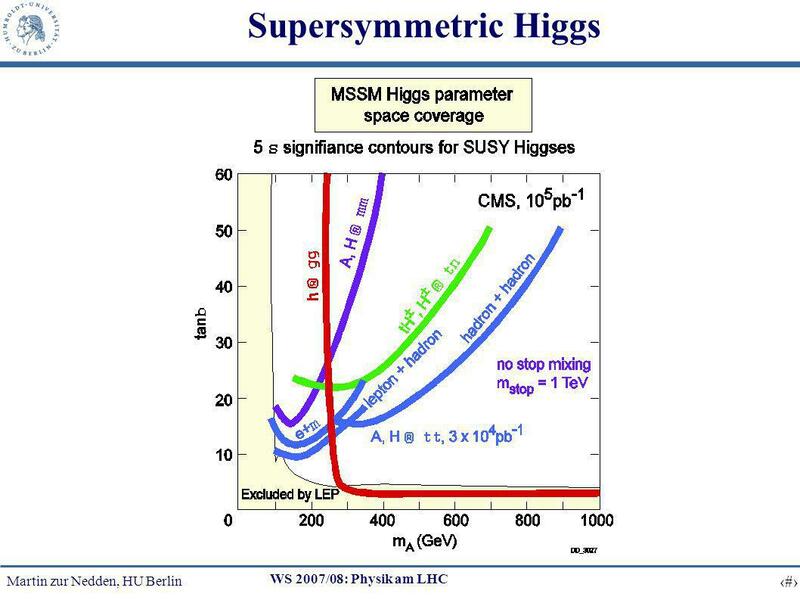 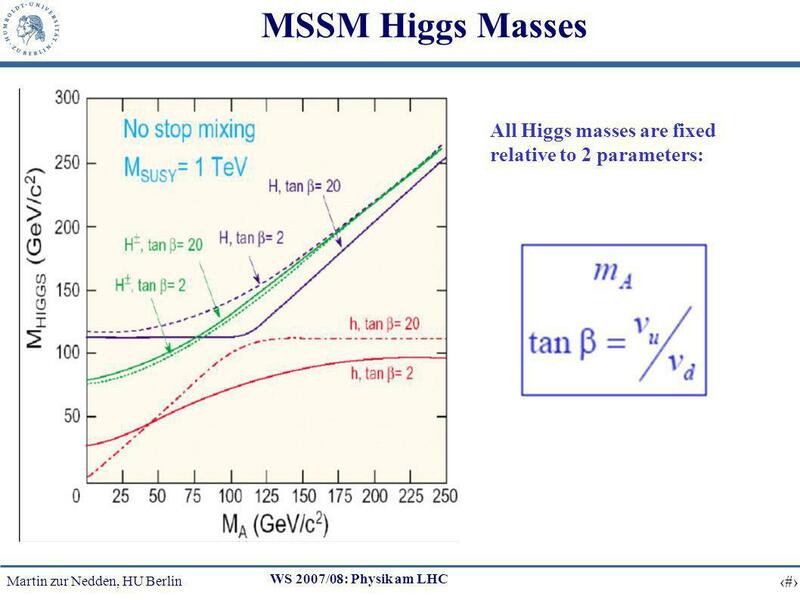 Higgs Boson Mass In Gauge-Mediated Supersymmetry Breaking Abdelhamid Albaid In collaboration with Prof. K. S. Babu Spring 2012 Physics Seminar Wichita.